Did Tey Kill King Tut? Background information about the possible murder of Tutankhamun and a prime suspect - Tey. In 1968 and 1978 x-ray examinations of the mummy of Tutankhamun revealed that the mummy of King Tut had a mysterious dense spot on the lower back of the skull. This lead to speculation that the young King Tut had been killed, or murdered, by a blow on his head. But did Did Tey Kill King Tut? Tey, the wife of Ay and successor of Tutankhamun, has been put forward as a prime suspect in the possible murder of King Tut. 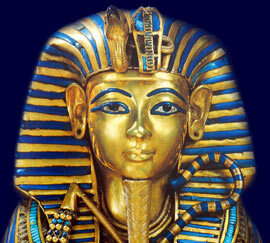 But who was Tey and what relationship did she have with the Pharaoh Tutankhamun? Nefertiti influenced and supported her husband in their religious revolution which changed Ancient Egypt from a polytheistic religion, with many gods, to monotheism (the worship of one god). Did Tey Kill King Tut? - Did Tey have the Opportunity? Tey would have had some access to Tutankhamun as wife of Ay and due to her close association with the royal family being the wet nurse of Nefertiti, the step-mother of Tutankhamun. Tey's position would have been powerful enough to have someone kill King Tut or murder him herself. Did Tey Kill King Tut? - Did Tey have a Motive? The relationship of Tey to Ay and Nefertiti are the key to possible motives. On face value, an ambitious wife would prefer her husband to be Pharaoh rather than the boy-king Tutankhamun. But there is a more mysterious possibility. There is some speculation that when Akhenaten, the father of Tutankhamun, died that Nefertiti assumed the sole role as the Pharaoh referred to as Smenkhkare Ankhetkheperure. The rule of Smenkhkare only lasted two years, the successor was Tutankhamun - was this pharaoh murdered? If this theory was true Tey's close association with Nefertiti could have led to a lasting grudge against Tutankhamun.